The problem many beginning investors have is the pressure to just fill the space. They have a vacancy and they have pending mortgage payments, so their first thought is to get someone in that property and get that flow out outbound cash stopped. This path leads many landlords to a whole new flow of problems and for some even potentially to foreclosure and bankruptcy. In our experience it is extremely rare for the first potential tenant who contacts you to be the ideal tenant. More likely they are just more skilled at finding new vacancies than the tenants you really want in your property. If your entire business model as a landlord or property manager hinges on having the property filled immediately, now would be a great time to start looking for foreclosure lawyers so you are ready when everything collapses. Your goal should be to have the property filled quickly, but you also need to build up reserves to cover any shortfalls you may run into. Now for the actual screening, one of the first items you need for potential tenants are application forms. The application form ensures you have all the information you need pre-planned out so you don’t forget anything. Some of the items on your application should include previous landlord contact numbers. Not just the current landlord, but also the previous landlord and if possible the landlord before that as well. 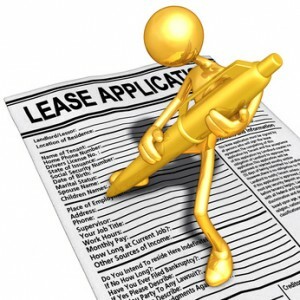 Their current landlord may not be as forthcoming about the type of tenants they are if he is trying to get rid of them. The previous landlord has no such agenda and will typically be more than willing to spill the beans if they are problematic. Also include on your form employment information and income. You need to be able to contact their employer to verify they are working and for potential references from employers. If their employer hints that they won;t be there much longer due to their work habits this won’t bode well for you getting paid rent. Also if you have an idea of their income you can determine if they can afford your property. With recent privacy laws becoming much more common, sometimes tenants and employers are becoming reticent about supplying some of the information to you that is required to do a thorough check of tenants. If this is the case, as long as you are not preventing possible tenants from renting from you due to racial, religious or any type of prejudicial reasons, you also don’t have to rent to them if you cannot determine everything you need to know. There are many other items you can include on your application including personal references, credit references and even nearest relative if you choose. The important part is you need to spend the time once you have acquired all of this information, and actually follow up with all the contacts on the application to make sure everything is valid. Unless you do the calling and talk to everyone, your screening is incomplete. If you take the time to do this prior to renting out your property, you will find you have far fewer problems, much more reliable tenants and a better overall experience as a landlord. After all, no one wants to evict someone, do they? Bill Biko is an experienced landlord dedicated to helping other landlords, and authored the Alberta Landlord Eviction Guide. Bill provides a free tenant screening training video on his website, The Educated Landlord.com.